• SIGN UP SHEET WILL BE HUNG OUTSIDE BEGINNING AT 7 am! Each day. • Be courteous to neighbors and do not block driveways or fire hydrants. One of two nightstands, part of a five piece set made by South Pacific. Quality materials/well built! 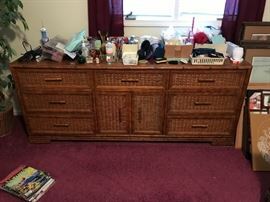 South Pacific Dresser, part of a five piece set! Beautiful pieces, quality! Tall dresser part of the five piece bedroom set, king headboard and frame also part. 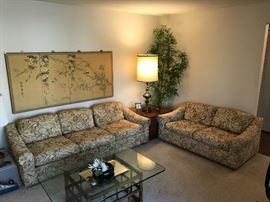 Selig of Monroe vintage Couch, Loveseat, and a matching glass top table. 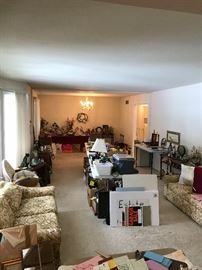 All in excellent condition, except the back right leg of loveseat needs some work. Fabric free of damage or wear! 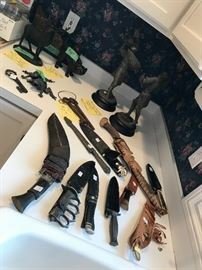 Some knives, and cast iron collectible pieces! Clear glassware including serving pieces and glasses and stemware! 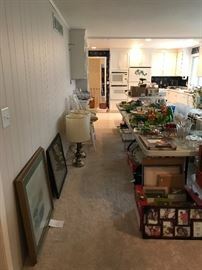 If you zoom in you will see lots of household items, Viking colored glass, silver pieces, small kitchen appliances, candles, picture frames, and much more! Artwork, barstools, lamps and so much more! Room filled with while glassware, baking and serving! 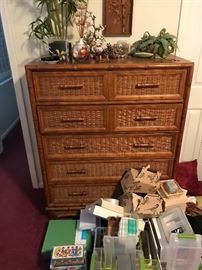 Office supplies, paper, envelopes, printers, several vintage telephones, Craft items! Jewelry! 72”x34” Asian hand painted wall panels! Lamp, artificial bamboo tree! Candles! Some barely used others brand new! Some still in boxes. Partylite, Yankee, Etc. Vintage records, including 45’s! Cd’s, DVD’s, and more! Many porcelain flower and bird collectibles! Old coffee table, wood mask carvings, homie collectibles, beanie babies in cases, bust, Jewelry box. Antique server! Early 1900’s alarm clock made in Germany! Vintage Asian style inlay cabinet! Dimensions= 28H, 16D, 31W. Excellent quality! 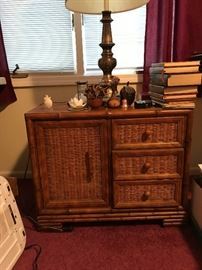 Mantle clock, Asian decor and a small wood table on wheels. Also, to the left are some vintage binoculars, weather station, and two radios! Various gun powder flasks and horns! Scrimshaw pieces. Military medals and Russian belts with buckles and misc different military buckles. Easter decorations! Some vintage, some new! Christmas Decorations! Some vintage and some new! Much more not shown! Fall decorations, including Halloween and Thanksgiving! Some vintage and some new! Lionel Train in box, misc leather gear for guns and knives on wall. Zoom in on the shelves, you will see wooden Duck and Fish carvings! Some signed by the artist! Carved Ducks and Fish! Two geese flying! Wall shelves full of wicker baskets, boxes filled with good quality artificial flowers and greenery. Heavy duty vintage round table with four chairs. I framed Signed Maynard Reece painting. Indian artifacts, western and military spurs, artificial electric fireplace, antique rocker. 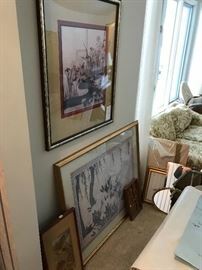 Misc toys, framed and signed Maynard Reece paintings. White train/activity table. Artificial Black Bear rug, some misc animal pelts, along with misc military items. Vintage salt and pepper collection. Some pieces date back to 1930’s. Vintage Whiskey Decanters, variety of brass items. Lamp based and shades. Cigar boxes. Vintage toys. Tins including gun powder tins! 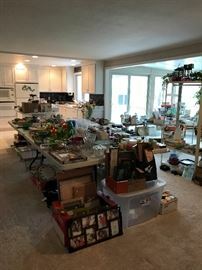 Lots of plant and garden items. Materials include brass, copper, glass, ceramic, pottery. There are also ceramic toad stools and other garden decorations! Vintage wedding gown. Canning items. Crafting items. Giraffe collection! Cabinet style stereo from the 1980’s! Miscellaneous raccoons as well as chipmunks. 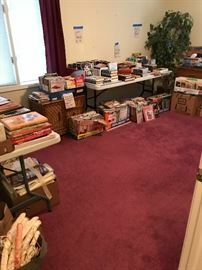 Keep in mind all bookshelves are for sale too! 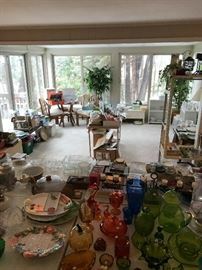 Dragonfly collection and miscellaneous yard and garden items! Glass top, Rattan table and four chairs! Excellent condition and quality piece! Copper bottom Revereware Pots and Pans set. 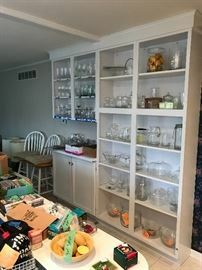 Vintage mason jars and other home decor.